Want to download a video on facebook? Want to transfer the video to your phone to watch it later? Then this article is just for you. Here in this tutorial, I am going to tell you the two easiest method by which you can download any Facebook videos for free. Just follow the tutorial and at the end of the article, you will know how to download facebook videos There is no need to download any facebook video downloader app or something. I am also going to tell you the way by which you can download private facebook videos for free 2018 and also facebook videos from closed group. Just follow the article. In this guide, I am going to tell you some of the easiest methods by which you can download facebook videos for free. You don’t need to copy paste the link to any other facebook video downloader tool to save the video. Just follow this guide and download any video that someone uploads to facebook in very easy way. 2. Now just copy the fb video url and paste in on the above website. To get the facebook video url, Just right click on fb video and there you will get a option to get the facebook video url. Just click on it and copy it. 3. After pasting the facebook video url, Just click on Download. 4. 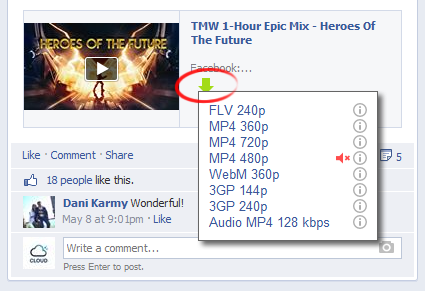 Now you will get the downloading link of the facebook video which you want to download. You can choose to download the video in HD format or SD format, based on your preference. That’s it, In this way you can easily download videos from facebook for free. 1. First of all, Go through the facebook videos which you want to download. 2. Now go through the page source. Just press ‘CTRL + U’ to view page source. 3. Now copy the whole page source. 5. Paste the page source in the box of the above website. 6. Now you will get the downloading link of the private facebook videos or facebook videos from closed group. Just click on download and you are good to go. It will get downloaded. In this way, you can easily download videos from closed for free 2018 and also private facebook videos for free 2018 . 2. This brings you to the FB mobile site, once there click on any video which you want to download. 3. While the video is playing if you are on a pc right click on the video screen and select “save video as” (sorry cant help the mac and linux folks out there) and pic a location on your pc to save the video. That’s it, the video will start downloading. In this way you can easily download facebook videos 2018 for free. This method is working 100% for sure and also the easily and working method to download videos from facebook. Isn’t this method simple?? If not, then follow the the below method on How to download videos from facebook 2018. This method is very simple. You just need to download a software and have to install a extension and the rest will be done by the software. So follow this simple steps and download any videos on facebook for free. 2. Now install the app to your pc/laptop. 3. After installing, it will redirect you to a page where you have to add the extension. Just add the extension to your chrome browser. 4. Once it successfully added. Now you will see a agreen arrow next to any video on facebook. 5. Now just go through the video you want to download and click on that green arrow. 6. Now it will tell you to choose the quality and format of the video to download. Choose it and click on download. That’s it, Now the video will get downloaded to your pc/laptop. Hope you like this tutorial on How to download videos from facebook for free. You can download private facebook videos for free and also the facebook videos from closed group. Just follow the Method 1 in order to download videos from closed group or private videos for free. If you have any question, then feel free to ask it in the comment section below. that just pastes your video url and you will get facebook free video.